Bound to the bench for the most important games of Michigan State’s season, Joshua Langford and Kyle Ahrens grew closer together during their absence. Doing rehab, getting treatment and everything else required to get back to normal can be an isolating experience. 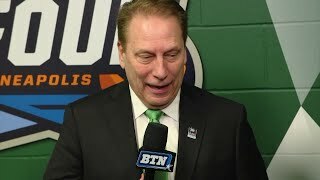 “The last couple of weeks, from the Big Ten tournament on, it seemed like it was a blur,” Izzo said as he wrapped up the Spartans’ 32-7 season. “But I guess now I can give credit where credit is due. And honestly, I feel this team gave me every single drop that they had. A school-record six Spartans – Chase Gianacakos, Collin Lucas, Grayson Miller, Matt Morrissey, Matt Sokol and Khari Willis – have been named to the 2019 National Football Foundation (NFF) Hampshire Honor Society, the NFF and College Football Hall of Fame announced on Wednesday. Both Nick Ward and Cassius Winston said after Michigan State’s season-ending loss to Texas Tech on Saturday that they hadn’t thought about the decision of whether or not to declare for the NBA draft.Four days later, their coach said he thinks both should consider it. “I would recommend, and I am recommending, that both of them take a look,” Spartans coach Tom Izzo said on Wednesday. The Michigan State football team is in the final week of spring practice as the Spartans prepare for the annual Green-White spring game, presented by McLaren Health Plan, on Saturday at 2 p.m. in Spartan Stadium. It started with a silhouetted Cassius Winston walking through the tunnel, walking toward a legacy-making weekend in Washington. Michigan State made the first impression during the “One Shining Moment” tradition, even though the Spartans much rather would have been the final vision in the annual NCAA tournament-recapping video. After one of the worst offensive seasons in program history, there’s one aspect most observers will be focusing on when Michigan State plays in its annual spring game on Saturday. With a new coordinator, the Spartans’ offense will be under plenty of scrutiny, something that won’t end after the Green and White game. Dantonio said Tuesday he has yet to determine whether the Spartans will draft teams and split up the roster, as they have done for much of his tenure, or continue to use the offense vs. defense, first string vs. second string approach he has used the past two years. Check in with Spartan Football as Spring Football starts up, Michigan State Rowers compete in China in the World University Championships, Davina Nguyen from Women’s Tennis opens up about her family, and Men’s Basketball arrives at the Final Four. When the Michigan State locker room doors opened late on Sunday night and the media rushed in, there were few tears to be seen. Spartans players were sullen but composed as they sat at their lockers. Sad but also grateful. Even after a 61-51 loss to Texas Tech in a national semifinal game here at the Final Four, players were able to start to appreciate the run they had been on for the last six weeks. 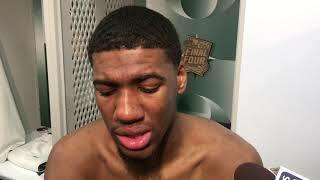 There weren’t many tears in the locker room afterward, perhaps because Michigan State had no emotion left to spill. And also because this didn’t feel like the end of a larger story. Tom Izzo just went to his eighth Final Four, and still is hunting his second national title. Cassius Winston just crafted one of the great point-guard seasons in program history – behind Magic Johnson and Mateen Cleaves – and he’ll be back. 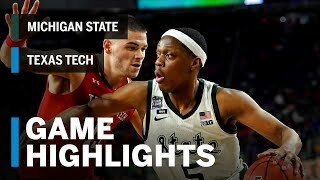 Junior guard Cassius Winston scored a team-high 16 points, but Michigan State struggled to find its offensive rhythm in a 61-51 loss to West Regional Champion Texas Tech in the Final Four of the NCAA Tournament at U.S. Bank Stadium on Saturday night. One more run? Down 13. Under 10 minutes remaining between one more game or a long trip home. Michigan State basketball’s battered-engine-that-could all season finally ran out of steam. Gassed by a Texas Tech defense that smothered them for much of the night, the Spartans put together one final rally, chopping a 13-point deficit to one point with 2:52 to play. But the Red Raiders’ All-American Jarrett Culver scored six straight points to lead them past MSU and into the championship game with a 61-51 victory on Saturday at U.S. Bank Stadium. The NCAA Tournament can bring the highest highs and the lowest lows, from cutting down nets to wiping away tears. Michigan State experienced them all in a three-week run, beating top-seeded Duke last week to reach the Final Four only to head to the final weekend of the season and run smack into the best defensive team in the nation. As the stage got bigger and bigger, this Michigan State team time and again found a way to overcome early deficits, to find another gear in the second half and pull out critical win after critical win on the road to the Final Four. When the stage got the biggest, Michigan State couldn’t finish off one more. Michigan State fell to Texas Tech, 61-51, in a NCAA Tournament national semifinal game in front of 72,711 fans at U.S. Bank Stadium on Saturday night. 1. Texas Tech never let MSU get comfortable. The Red Raiders were just better. Michigan State exceeded expectations. Josh Langford went down, Nick Ward was out for a month and never truly regained his old form and Kyle Ahrens missed the NCAA Tournament. No one expected Michigan State to make a run, but it did. Winston dealt with a foot injury and knee tendonitis, but he got the job done. Late in the second half on Saturday night, Michigan State found itself in a spot it had been before more than once this season, down double-digits with things starting to unravel. The Spartans were there against Michigan — twice — and managed to find a way to rally and beat their rival. They were down nine last week to Duke before rebounding to knock off the NCAA Tournament’s No. 1 overall seed and reach the Final Four. As time trickled away and all fates were sealed, Matt McQuaid walked over to Kenny Goins in what would be their final moments together as Michigan State Spartans. “I just told him I love him,” McQuaid said Saturday night in Minneapolis, after the season-ending loss to Texas Tech at the Final Four. Nobody could find Tom Izzo’s backpack. Several Michigan State staff members searched the locker room and the various connected rooms. 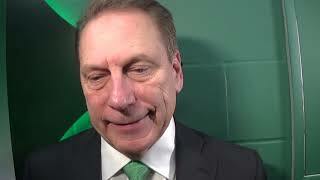 Izzo was holding court with reporters, but he’d stop talking eventually — maybe? — at which point he’d need to exit U.S. Bank Stadium for good. But not without his bag. Through the grief came frustration about what could have been done differently. Then came the reality: Michigan State basketball’s season is finished, and decisions about the future need to be made by a few Spartans. Return to MSU and chase for another Final Four and national title or test the pro process and pursue their dreams of playing in the NBA? Xavier Tillman will not test the NBA draft waters and return to Michigan State next year, while two of his teammates still have decisions to make about their future. 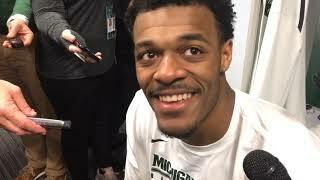 In the postgame locker room after Michigan State’s 61-51 loss to Texas Tech, Tillman said definitively that he will return to East Lansing for his junior season in 2019-20. It’s the nature of the NCAA Tournament. Things end quickly, and it doesn’t take long to start thinking of what’s next. Michigan State found itself in that position on Saturday night, a game earlier than it expected. The Spartans had just run into the suffocating defense of Texas Tech and saw its season end in the Final Four in a 61-51 loss to the Red Raiders at U.S. Bank Stadium. 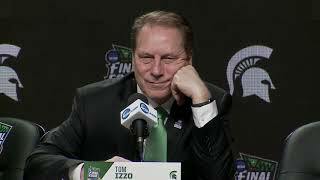 Of all the Final Fours Izzo’s made, only one other time did he get there — other than the year he won it — with the inner confidence that his team’s highest level of play would be good enough to win it … no matter what the opponent did. If Michigan State beats Texas Tech on Saturday and gets a win on Monday night to earn its third national title, it will be because of Winston. “He’s kind of covered the entire gamut,” Izzo said this week. “He scores points. He’s playing better defense. He’s making other players score points, and he almost gets to coach the team a little bit.